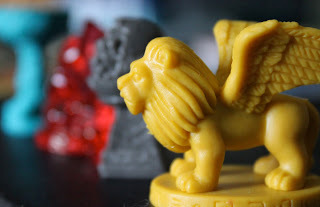 Cooperative board games are a relatively new genre of board game to me. While it can be frustrating in coming to a consensus on what should be done, its very satisfying to know that you have succeeded as a team. Sometimes they can be very frustrating to play, other times you are not really sure where the cooperative component to the game is, but when done well is a thing of beauty. Forbidden Island from GameWright Games is a spiritual successor to Z-Man Games Pandemic. I say spiritual as it is designed by Matt Leacock, who is also responsible for creating Pandemic, and has heavily borrowed its game mechanics in order to bring us a beautiful, smooth and innovative gameplay that promises fun time and time again. Inside the tin (TIN!) 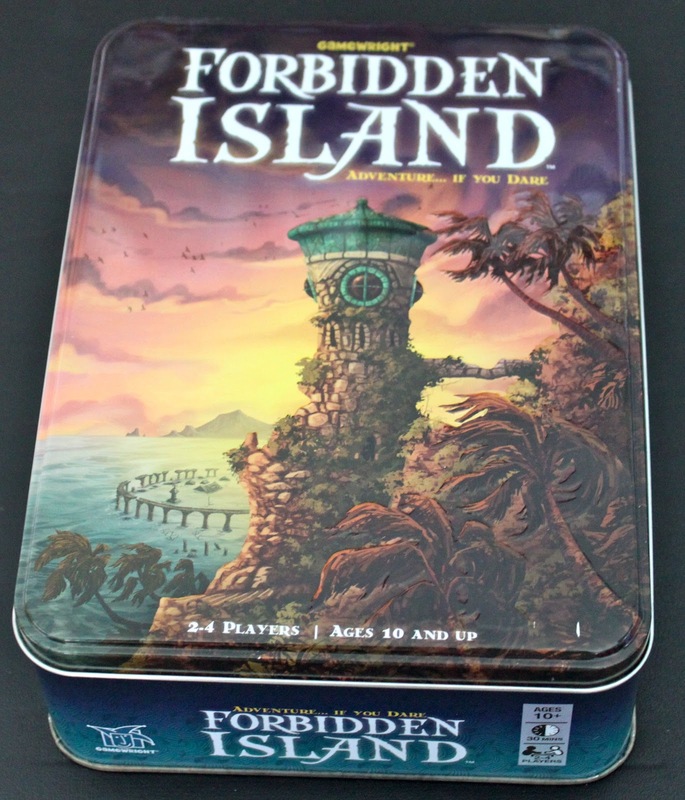 you will find double sided island tiles, role cards, pawns that match up with the role cards, island location cards, adventure cards, and four ancient artifacts. The players are a group of adventurers who arrive on a mysterious island to collect four ancient artifacts. However, upon arrival the island starts to sink, making time of the essence. Each player has a different role within the team, each with their own special ability. Players must race around the island, collecting adventure cards in order to lay claim the the ancient artifacts, all the while trying to keep the island from sinking long enough so they can safely make it back to the landing pad and helicopter to safety with their treasure. 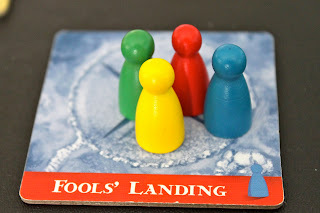 The game is played open handed, and players are encouraged to freely talk to each other and plan out the best choices for their moves, which can lead to some great conversations, especially if players have different thoughts on what the best choice would be. 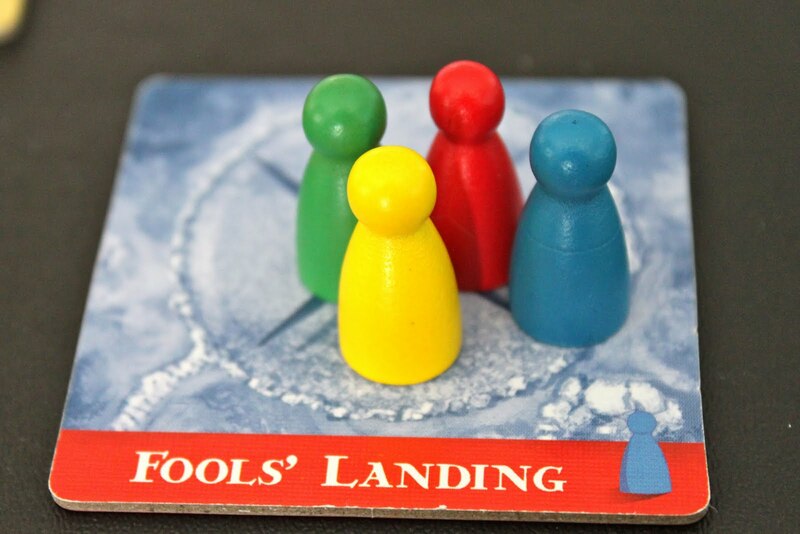 During play, a player will start off with 3 actions, where they can either move, claim an artifact or shore up an island tile (shoring up means that they will unsink a sinking part of the island. If they don't, they run the risk of not being able to pass through it later as it'll be sunk). 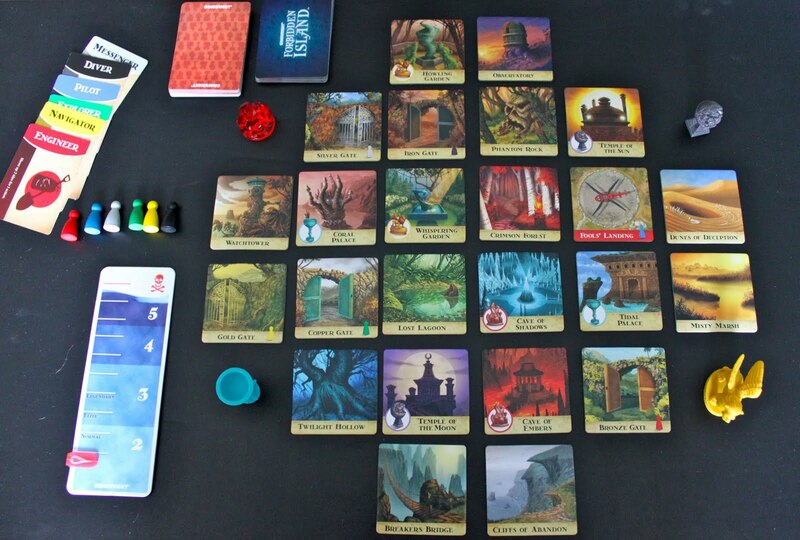 To claim an artifact, a player must be on a specific island tile and have enough adventure cards of the same artifact that they are trying to claim. To move, they move one island tile per action. 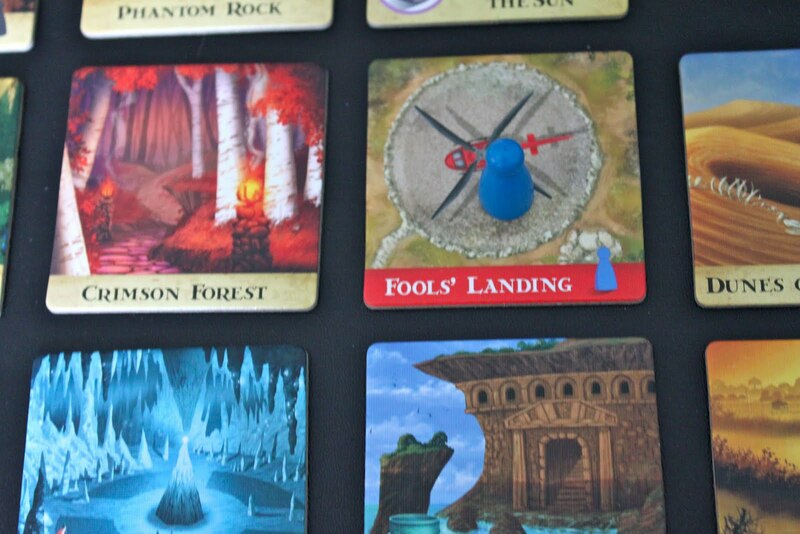 Once the adventure cards are drawn, the player will sink parts of the island by drawing a number of cards from the island deck equal to the water level indicated on the [waters rise chart]. depending on which cards are drawn, their corresponding island tiles are flipped to the blue-hued side and are now considered flooded. These flooded tiles are now sinking and can be shored up during a players action phase. Flooded tiles are not a good thing for players, but its much preferred to the alternative. 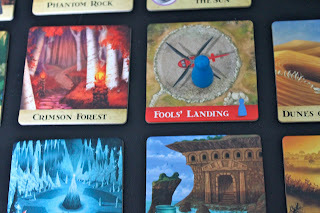 During the phase where players draw their adventure cards, if they were to draw the "Waters Rise" card, not good things will start to happen. 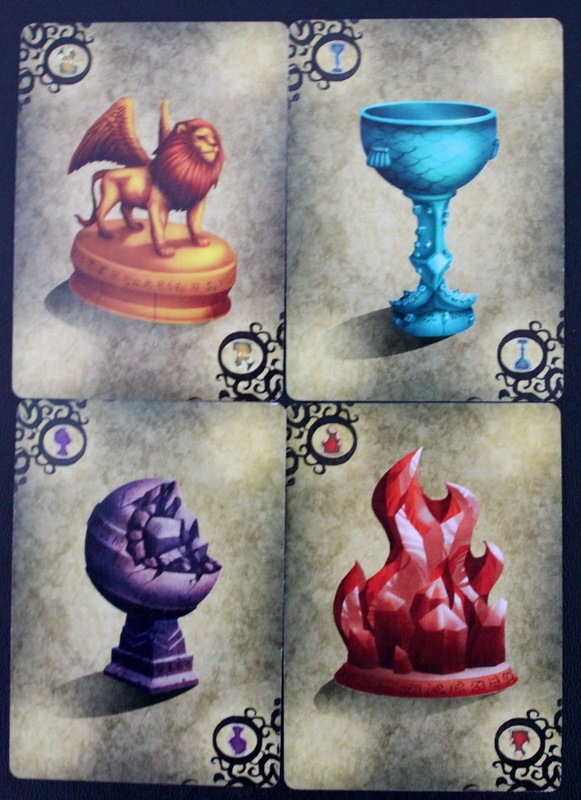 When it is drawn, the island cards that have previously been drawn are shuffled and put back on top of the island deck, the water level chart raises a level, and then cards are drawn from the island deck. If an island tiles card that is flooded is drawn, it is now considered sunk and both the tile and the card are removed from the game. This becomes a problem as that particular tile can no longer be visited, and is extremely not good if that was a location to lay claim to an artifact, or worse the only way out. 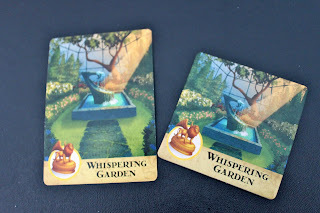 When a tile is sunk, both it and its matching card are removed from the game. Once all four artifacts have been claimed, the team must now race to the helicopter pad and escape before the island sinks completely. If they can do this, then the game is won. However, if they can not make it to the helicopter pad before it sinks, they will loose. I found that I enjoy this game quite a bit. 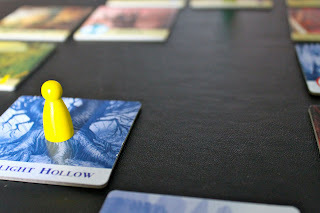 While in many respects it is exactly like Pandemic, there is much about it that is very unique and allows for it to hold its own. It's theme is fun and refreshing, and appeals to a wide audience. In Pandemic, when the action deck runs out, the game is over. However, in Forbidden Island when you get to the bottom of the deck, you reshuffle the discard and start anew. This allows for a slightly easier challenge to the game by comparison, which I think will allow for more re playability with friends and family. Another great thing about it is that because the game board is tile-based, it can be rearranged in multiple configurations, upping the challenge if you like. 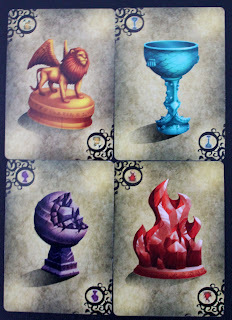 The game has been nominated for 2011 spiel des jahres and is a Mensa Select game, and definitely deserves any and all honors it receives. It's an affordable game, with good play value. I've been tempted many times to purchase it. This puts me closer to that end.